California Department of Transportation, or Caltrans, has started demolition and reconstruction on the California Incline Bridge, originally built in the 1930’s, in Santa Monica to meet current seismic standards, much to the detriment of already horrendous Westside traffic. The incline extends approximately 1,400 feet from the intersection of Ocean and California Avenues at the top of the Palisades bluffs to Pacific Coast Highway at the base of the bluffs, which is used by roughly 15,000 vehicles per day who will now likely migrate through Santa Monica Canyon. The replacement bridge, which will cover the same distance of 750 feet, will include a wider sidewalk, bicycle lanes and be reinforced with an extra five and a half feet of concrete with the overall goal for improved safety and prevention of collapsing in the event of an earthquake. Portions of the bluffs have given way, and crumbling concrete and exposed rebar are evident. The California Incline qualifies for replacement under the Highway Bridge Program (HBP) and therefore 88.5% of the cost (a whopping $20 million) to rebuild can be paid for with Federal rather than local funds. The California Incline will be closed for the entire duration of the project, which began in April 2015 and is slated to reopen in time for the 2016 Memorial Day weekend. A project hotline is at (888) 303-6026. Driving Tips: MCM Construction Inc., the contractor, has been authorized to work from 7 a.m. to 10 p.m. Mondays through Fridays and from 7 a.m. to 9 p.m. on Saturdays. Caltrans will allow MCM to close one northbound lane of PCH from 9 a.m. to 1 p.m. and from 7 p.m. to 10 p.m. between Labor Day and Memorial Day. No PCH lane closures will be allowed during the summer. Drivers who typically take the incline to go north on Pacific Coast Highway will be advised to head south on Lincoln Boulevard to the 10 Freeway and then merge onto northbound PCH at the McClure Tunnel. Motorists heading south on PCH will be directed to go past the incline to the recently refurbished Moomat Ahiko Way to reach downtown Santa Monica or to exit the 10 at Lincoln Boulevard for points farther east. Sunset can also be used as an alternate route. 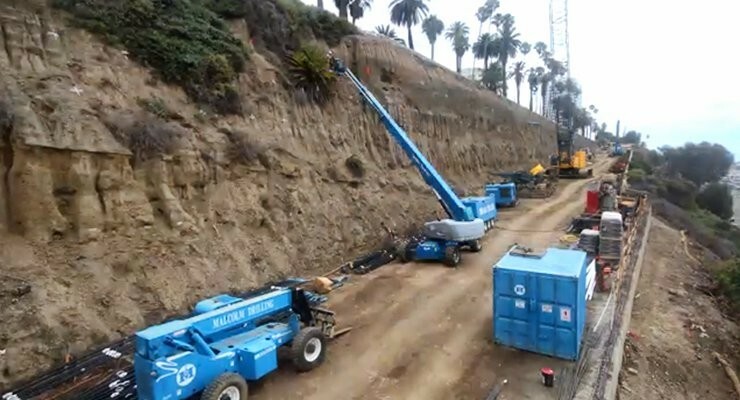 The City of Santa Monica, in cooperation with the California Department of Transportation (Caltrans),will reconstruct the California Incline Bridge to meet current seismic standards. The incline extends a distance of approximately 1,400 feet from the intersection of Ocean and California Avenues at the top of the Palisades bluffs to the Pacific Coast Highway (SR-1) at the base of the bluffs. The bridge portion of the incline is 750 feet long and currently consists of an 8” concrete slab supported on transverse floor beams made of concrete. The project entails demolition of the existing bridge and construction of a new bridge at the same location. The new structure will include a wider sidewalk and bicycle lanes. The north and south ends of the incline will remain a three-lane roadway that terminates at a signalized intersection. The new bridge will consist of a pile supported reinforced concrete slab structure with a width of 52-feet, an increase of 5-feet 8-inches over the existing structure. Replacement of the bridge with a new structure, built to current seismic standards, will correct deficiencies in the bridge and make it safe for vehicular, bicycle, and pedestrian use. The California Incline qualifies for replacement under the Highway Bridge Program (HBP) and therefore 88.5% of the cost to rebuild can be paid for with Federal rather than local funds. Construction is scheduled to begin April 20, 2015 with an estimated duration of 12-13 months. Westside traffic, already the stuff of legends, is expected to worsen dramatically with the closing Monday of the California Incline in Santa Monica for a complete reconstruction designed to keep the structure from collapsing in an earthquake. As part of a $20-million project, workers will begin demolishing the severely deteriorated road, technically a bridge, in anticipation of rebuilding it. The link, which descends from Ocean Avenue to Pacific Coast Highway, connecting the bluffs with the beach, is used by 15,000 vehicles daily. Pacific Palisades and Malibu residents, in particular, anticipate that motorists will jam local canyon roads as they seek to shave minutes off disrupted commutes. An environmental impact report prepared for the long-overdue project predicted that the close of the incline for as long as 13 months will cause “saturation” levels of traffic in Santa Monica Canyon. Drivers who typically take the incline to go north on Pacific Coast Highway will be advised to head south on Lincoln Boulevard to the 10 Freeway and then merge onto northbound PCH at the McClure Tunnel. Motorists heading south on PCH will be directed to go past the incline to the recently refurbished Moomat Ahiko Way to reach downtown Santa Monica or to exit the 10 at Lincoln Boulevard for points farther east. Built in the 1930s, the incline falls well shy of meeting current seismic standards. Portions of the bluffs have given way, and crumbling concrete and exposed rebar are evident. The new bridge will be 52 feet wide, 5 1/2 feet wider than the existing structure. It will feature a wider sidewalk and bicycle lanes. MCM Construction Inc., the contractor, has been authorized to work from 7 a.m. to 10 p.m. Mondays through Fridays and from 7 a.m. to 9 p.m. on Saturdays. Caltrans will allow MCM to close one northbound lane of PCH from 9 a.m. to 1 p.m. and from 7 p.m. to 10 p.m. between Labor Day and Memorial Day. No PCH lane closures will be allowed during the summer. The incline is expected to reopen in time for the 2016 Memorial Day weekend. A project hotline is at (888) 303-6026.